I am slowly free motion quilting my "Not playing the supporting role!" quilt. 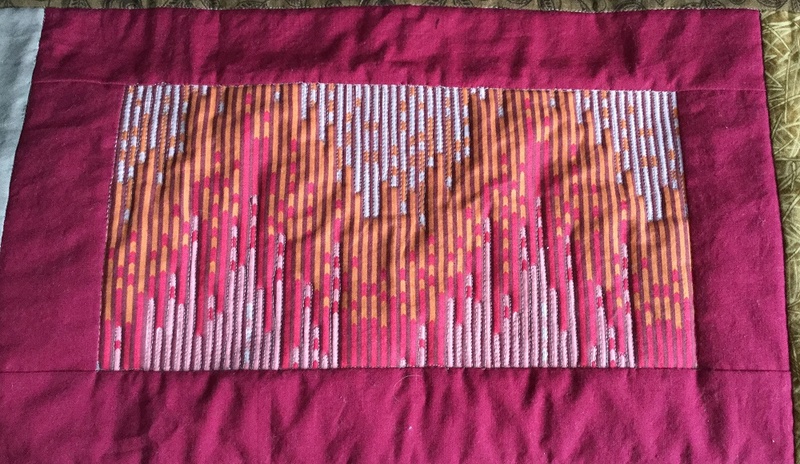 So far I FMQ a few blocks based on the fabric's design. This is my favourite - the fabric almost looks like a heart beat. 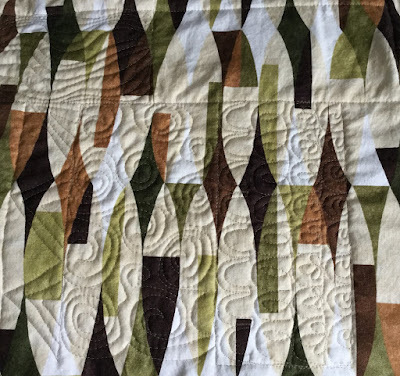 I quilted all of the pale strips,from the top and the bottom. It was great practice for my precision, which is not great but was getting better by the end! I used a different approach for both of these blocks. In the first image, I quilted around each arc while in the second block I quilted within the arced space. I expected to like the second one best, but I think that the effect of quilting around the arcs gives more interest. 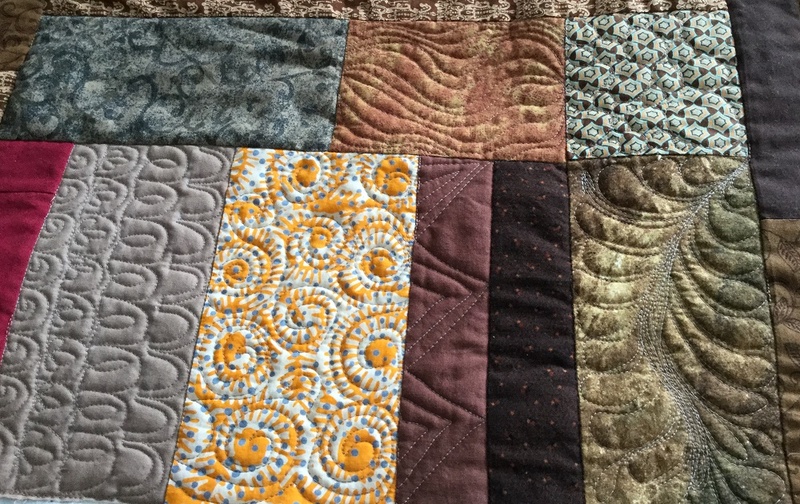 In the top row, I quilted "S" shapes and large pebbles. In the lower row, I quilted arches and then placed different designs within each row of arches. The orange fabric was perfect for swirls while the brown solid got chevrons. The last fabric in the bottom row got a nice big feather. This image is of the back of the quilt, in roughly the same area as the picture above. It's now time to choose designs for the rest of the quilt. I've made a notebook of FMQ designs that I've used and practiced during the last couple of years. Some of the designs are drawn on the pages while others were practiced on scraps of paper that are now taped into the book. It's nothing fancy but it really helps me chose different options instead of always using the same ones. There was a blog hop this week featuring one of Made by Marney's foundation paper pieced blocks. It was available free (and still is for a while I believe - see Related Links below). I haven't added the penguin's eyes yet, but isn't he adorable? Made by Marney also has other cute Valentines and Easter foundation paper pieced blocks. Check them out. They are gorgeous! My FMQ notebook is a work in progress. Every once in a while I go through my stacks of papers and find all kinds of FMQ patterns that I've worked on. These are then added to the book. On Friday I was doodling and was finally able to draw a design that I've been trying to figure out for months now. Somehow I got it right. I'm looking forward to using it in this quilt! Great News! 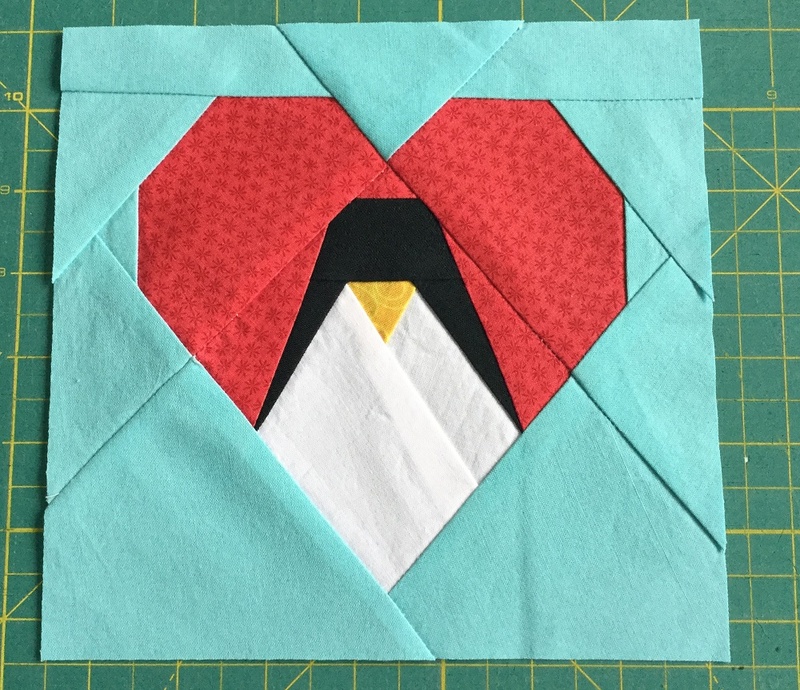 My Free Motion Quilting was featured by Connie on Linky Tuesday, while Hearty Penguin was featured by Susan on Midweek Makers. Hooray! 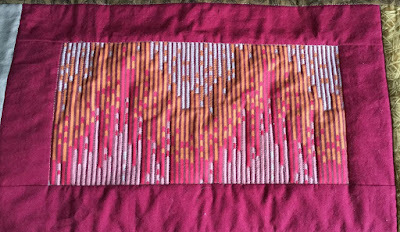 I love your FMQ, it's something I can't get the hang of but you have inspired me to have another go. Thanks! Thanks Kay. I really believe that if your machine can do it, that anyone can learn. It just takes a lot of practice - but the results are so worth it. Slowly but surely - the quilting so far looks fantastic! 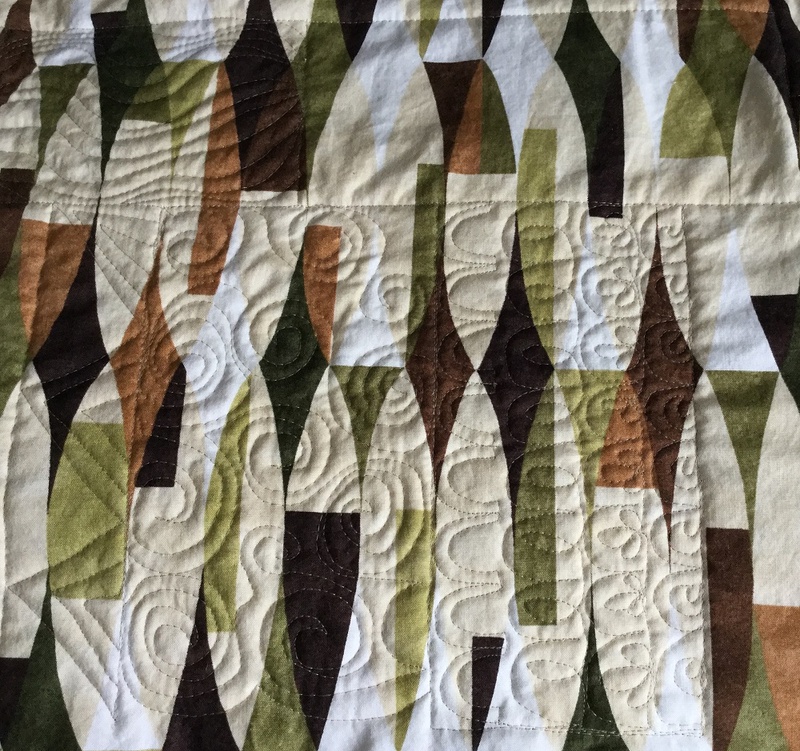 Thanks Muv, I've had such a great time playing with this quilt! Love the little penguin - too cute! Where will he eventually live? Beautiful work and a great way to practice different ways to free motion quilt! Thanks Connie, and thanks for featuring my post. 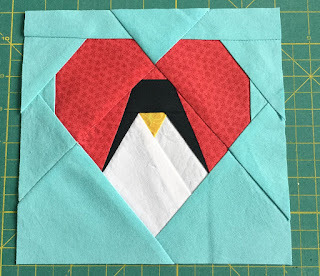 Hi Andree, Thanks for featuring my Made By Marney penguin block. LUV IT! You do such a nice job sharing information and helping quilters learn.